I was the preschool party mom for the day. I packed up my goodies and the kids grabbed jackets to line up for the end of the day. I chatted with the restless kids who already stood in line while they waited for classmates to finish up. So, I was inspired. A game of “I Spy” would help pass the time and keep these preschoolers from losing it in the line. I think I’m being too easy on them, so I go in for a tough one. Well, no, my gray hair wasn’t the answer I was looking for, but thanks for pointing that out. Preschoolers can be so stinkin’ honest. Gotta love ’em! Maybe we grow out of it, the honesty. We start filtering our thoughts and hiding away the trueness and the realness of our emotions, dreams and even disappointments. Some of it’s healthy. No one needs to be blurting out the ‘truth’ about hating your friend’s new haircut, after all. And yet, when it’s with God, why do we still hide? Why do we fake goodness and pretend to have it all together with Him? Why do we act generous and humble and keep our real motives hidden deep down? Why do we hold back from Him when we’re hurt? I read about Martha in Scripture. We love to pick on her. Too busy in the kitchen to listen to Jesus-Martha. Too worried about her sister to check her own heart and motives-Martha. Yet, there she is, bringing it all to Jesus. Sure, maybe she slammed the pots and pans around the kitchen for a little bit and maybe she let the oven door slam a few times as she worked herself up into a frenzy. But eventually she strode right out of that kitchen and told Jesus what had her in a tizzy. “Lord, do you not care that my sister has left me to serve alone? Tell her then to help me” (Luke 10:38-42 ESV). But when we’re overwhelmed and distracted and trying to handle everything on our own and failing at it all, it’s hard to feel like He cares. That’s the truth for us sometimes, too. We see all the ugly bits of Martha’s heart because she laid it all out there. She was one honest woman, carrying even her worst sin and her pettiness and all of her weakness and dumping the messy lot of it down at Jesus’s feet and asking Him if He even cares about what she’s going through. She did it when Jesus and His disciples were guests in her home. She did it again in when her brother, Lazarus, was dead—dead because she sent Jesus a message telling Him that her brother was sick and to hurry to Bethany to heal this dear friend, and Jesus didn’t come for days. He delayed and Lazarus died. So Martha took her troubles to Jesus: “Lord, if you had been here, my brother would not have died. ” (John 11:21 ESV). Maybe we hide them away because we don’t want to face them ourselves, don’t want to look in that mirror and see the brokenness in our own reflection. Or maybe we think we can avoid God’s sadness over our failures, that somehow we’ve let Him down and if we just try hard enough, we can get back to that perfect good Christian girl who juggles it all and who stays calm and whom everyone can depend on. 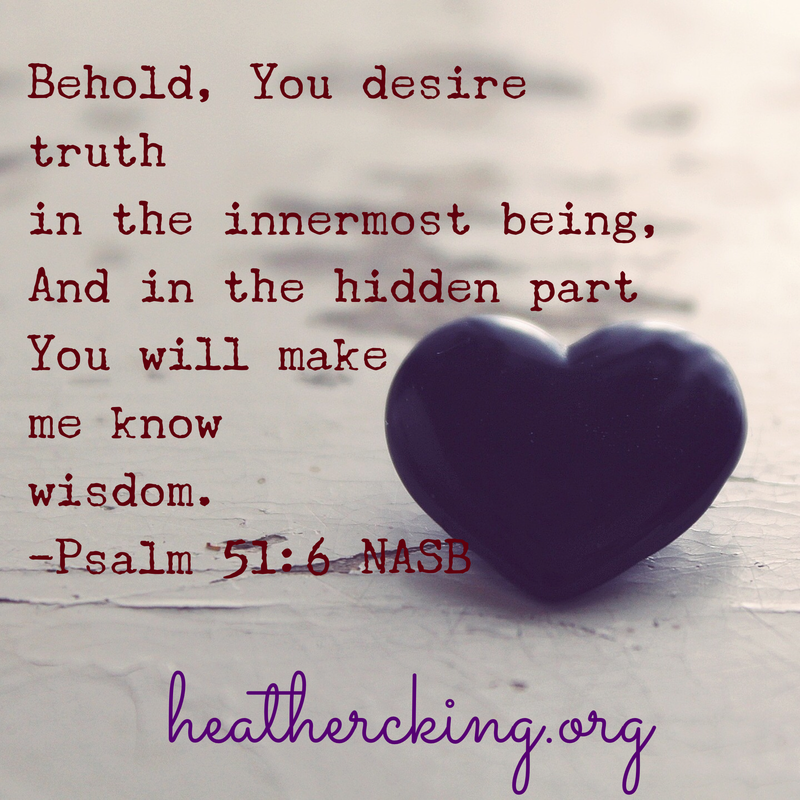 Truth from the inside out, that’s what Jesus wants from us. And, we need not fear how He’ll respond when we leave that mess at His feet. Martha’ s honesty allowed Jesus to do the greater work in her, to teach her, to grow her faith, to help her know Him more. Yet, He never lost His temper with her. He didn’t turn her away or reject her or refuse to help. He loved her so, and He traded her mess for His mercy. Bring it to Jesus. All of it. Lay it at His feet today. Don’t be embarrassed. Don’t be afraid. The moment you give it to Him is the very moment He can love you through the healing and forgiveness and help you overcome. Thank you, Heather, for this wonderful insight!